Joseph Joachim already performed as a child and started his studies at the Conservatory in Vienna in 1838. He finished his studies when he was twelve and moved on to Leipzig, where Felix Mendelssohn-Bartholdy was his teacher. In 1849 he became concertmaster at Franz Liszt's orchestra in Weimar. Mendelssohn-Bartholdy, Liszt and Johannes Brahms were all close friends. Musically he slowly moved away from Liszt and towards Brahms. From 1853 until 1866 he was concertmaster in Hanover. There he met the singer Amalie Weiss, whom he married in 1863. They had six children, but his jealousy resulted in a divorce in 1884. In 1868 he became the director of the Hochschule in Berlin and in 1869 he started the Joachim-quartet, which existed until his death in 1907. From 1882 until 1887 he was conductor at the Berlin Philharmonic. He was also famous as a teacher. Joachim often travelled abroad and received many titles and awards. He was seen by many as the greatest violinist of his time and he performed many times together with Clara Schumann. 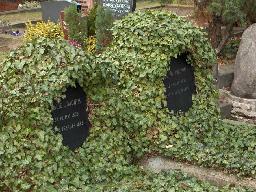 The grave of Joseph and Amalie Joachim at the Kaiser-Wilhelm-Gedächtnis-Friedhof, Berlin.